I have been doing a challenge to produce a picture based on my recollection of December. It’s timely of course being close to Christmas and that has influenced the picture produced here. The index X-ray came from a man, originally African, with pneumocystis pneumonia, almost certainly based on immune deficiency – HIV – a disease that in retrospect we were seeing during medical training in Central Africa during the late 1960 and 1970s although it had not been recognised as a different disease, or even named, at that time. The X-ray was paired with a photo of a wild flower that grew in the bush around our area – Gloriosa superba – what we had known as the Flame Lily. During the hot wet month of December when the long-grass grew higher than our heads, and the bush was hot, damp, and full of colour; huge edible mushrooms and insects of every hue. As children we would make forays into the wild areas collecting flame lilies to decorate our home before Christmas, or take bunches to the old people. This image shows flames bursting from a chest X-ray, paradoxically signifying the beauty of Africa, but also the destructive nature of the epidemic that swept the continent and still spreads today. After a good friend married to a mining engineer asked me to consider make a picture relating to mining diseases, I chose an X-ray of a person with severe emphysema and Progressive Massive Fibrosis of the lung due to silicosis. The name silica comes from the Latin word silex – a flint. My upbringing from the late 1940s through to the 1970s was in a small copper-mining town, part of a series of mines known as the Copperbelt in Zambia. Almost the entire population was dependent one way or another on mining for a living, as was my father who worked underground. Underground workers spent their shifts breathing silica dust released during blasting. The Miners Phthisis Board figured prominently in our lives and had the power to dictate whether a man was allowed to work. Miner’s phthisis (or Potter’s Rot) is a debilitating occupational disease due to deposition of fine grains of crystalline silica dust in the lung, and the body’s immunological reaction to it. It causes fibrous scarring of the lung that restricts the ability of the tissue to absorb oxygen in exchange for carbon dioxide. It leads to emphysema with chronic shortness of breath, cough, and cyanosis (blueness of the skin). Sometimes the immune response is overwhelming and causes large lumps of fibrous tissue known as Progressive Massive Fibrosis (PMF) to form. It predisposes to infections, especially TB, and the tissue can break down causing lung cavities. A major concern in mining and other industries, silicosis has caused such devastation that it is an important economic issue which governments cannot ignore, therefore focus was very much on the financial interests of mining. Other risks of silica were not appreciated till relatively recently. Since the 1990s there’s been re-evaluation of its role in triggering auto-immune diseases such as rheumatoid arthritis and sarcoidosis. The ubiquity of silicosis throughout the world has given rise to an entire culture, particularly within coal-mining communities. Many ballads, poems, and works of art relate to this disease. The paradox is that the men must work to live, whilst knowing they work to die. 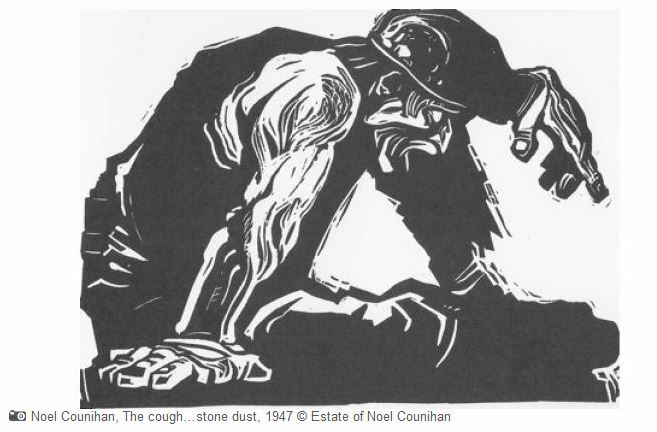 its moorings and ought to be tied back down…..
A 1940s lino-print The Cough by Noel Counihan 1947 is particularly moving and reminds me of heart-wrenching encounters with men, struggling for breath, dying of emphysema due to dust inhalation, smoking, and recurrent infections, whilst I was working in a chest hospital in a coal mining area of England. 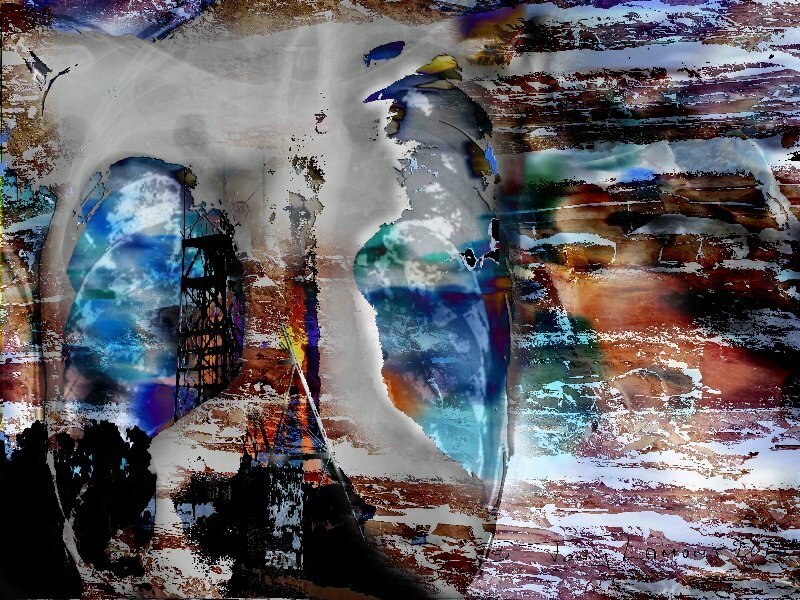 My picture, based around a severe case of PMF with collapse, fibrosis, and cavitation in the upper zones of the lung, includes photos of a mining rock-face and a shaft headgear such as those that were central to our life in Zambia, and which will be familiar to many mining communities. On the right side of the image a faintly perceived ghost-like figure can be seen.